Virgin Mary, Mother of fair love, Mother who never refuses to come to the aid of a child in need, Mother whose hands never cease to serve your beloved children because they are moved by the divine love and immense mercy that exist in your heart, cast your compassionate eyes upon me and see the snarl of knots that exists in my life. You know very well how desperate I am, my pain, and how I am bound by these knots. Mary, Mother to whom God entrusted the undoing of the knots in the lives of his children, I entrust into your hands the ribbon of my life. No one, not even the evil one himself, can take it away from your precious care. In your hands there is no knot that cannot be undone. 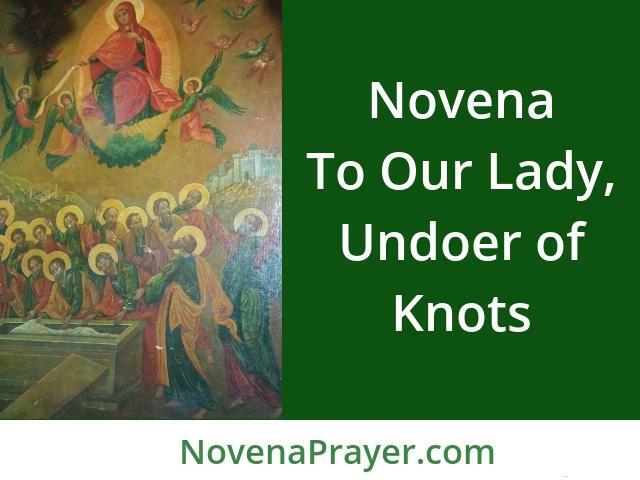 Powerful Mother, by your grace and intercessory power with Your Son and My Liberator, Jesus, take into your hands today this knot. I beg you to undo it for the glory of God, once for all. You are my hope. O my Lady, you are the only consolation God gives me, the fortification of my feeble strength, the enrichment of my destitution, and, with Christ, the freedom from my chains. Keep me, guide me, protect me, o safe refuge!